England were frustrated by Kraigg Brathwaite's composed century as West Indies had the better of the fourth day of the second Test in Grenada. On a pitch that remains lifeless, a draw seems the most likely result, lengthening England's wait for a first overseas win since 2012. At 24 years and 115 days, Joe Root is the second youngest Englishman to reach 2,000 Test runs, after Alastair Cook, who was 23 and 79 days. Kraigg Brathwaite, at 22 years and 144 days, is the third youngest West Indian to reach four Test centuries, after George Headley and Gary Sobers. If a positive result on the final day is possible, then it is Alastair Cook's men who are more likely to earn a 1-0 series lead. "We'll chase anything, we just need enough time," Root told BBC Sport. "We have to have a really good session with the ball in the morning. "West Indies need need a lot of credit for the way they played tonight. They were under quite a bit of pressure with lead we had, but they have got themselves back in the game. "We will have a scrap on our hands if we want to get a result." England will at least have the opportunity to bowl with a new ball and will hope to find the swing movement that made James Anderson dangerous before lunch, when Devon Smith failed to withdraw his bat from an outswinger and deflected the ball on to his stumps. Thereafter, Brathwaite and Darren Bravo made England toil on a surface showing little pace or bounce and only slow turn. They shared 142 for the second wicket, with Brathwaite overcoming some early uncertainty outside off stump to cut repeatedly and the more assured Bravo occasionally unfurling flamboyant drives. In the face of West Indian patience, England were able to create nothing more than half-chances. Stuart Broad almost had Brathwaite glove to slip, while the otherwise disappointing off-spin of Moeen Ali saw Bravo flash past gully and and Brathwaite nearly lob to mid-wicket. In the end, mid-way through the evening session, England's perseverance with a plan of hanging the ball outside off stump paid off as Bravo edged Broad through to wicketkeeper Jos Buttler. Brathwaite remained, joined by Marlon Samuels, who received no obvious response to the saluting send-off he gave Ben Stokes on the third evening. The right-handed opener was the recipient of a failed lbw review from the bowling of Chris Jordan, then completed his fourth Test century with another cut off Anderson. 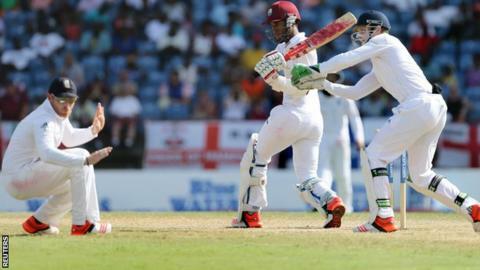 "England have got to remember the West Indies are only 37 ahead, with 98 overs left. I reckon you've got 50 overs to bowl the West Indies out, until tea. It's not doom and gloom. Those who play club cricket will often take those wickets in 50 overs, but I guess not on a pitch like this. I'm expecting a Calypso collapso at some stage." That sealed an ideal day for West Indies, who chipped through the England batting in the morning session with plenty of help from the tourists. The impressive leg-spin of Devendra Bishoo had Buttler stumped by some distance and Broad caught from a gloved sweep, either side of Jordan being run-out in a mix-up with Root. That was the only mistake of an imperious Root knock, the 24-year-old becoming the second-youngest England player to reach 2,000 Test runs and only the ninth man to make four scores in excess of 150 before the age of 25. Cutting the seamers and looking to hit straight or slog-sweep against Bishoo, he farmed the strike when partnered with last-man Anderson to add 33 for the 10th wicket. He looked primed for a second Test double hundred, but was denied when Anderson was run-out in dozy fashion, failing to ground his bat, perhaps not expecting Jason Holder to gather a return from high above his head. In frustration, Root hit the ground with his bat and threw his helmet when across the boundary edge, while the visitors were left short of a lead that would pressure West Indies. Ultimately, though, it is wickets, rather than runs, that are the problem for England.